1. Chateau Eza, Cote d'Azur: Love won't be the only thing that takes one's breath away here — guests will be awe-struck by the Mediterranean views spread out below their cliff-side perch. Just 10 magnificent rooms and suites offer plenty of privacy, plus in-room massage and occasional stone fireplaces, Jacuzzis®, and private balconies. 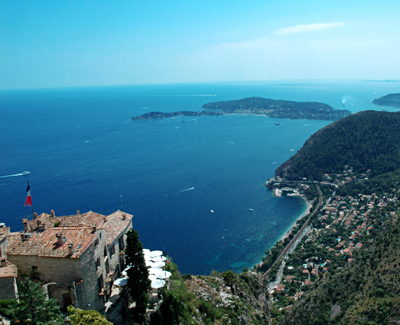 Explore the thousand-year-old city of Eza, or take the hotel's limo service along the French Riviera. 2. Hotel Splendido, Portofino: Private balconies spilling over with fragrant flowers, the warm Italian sun, and those views! It's hard to imagine a more romantic setting for a honeymoon or any other special occasion. Open-air dining is especially amorous at sunset, as lights twinkle on in the village below. Other romantics who've visited this love-nest include Taylor and Burton and Bacall and Bogart. 3. Blue Palace Resort & Spa, Crete: Odysseus might have wooed Penelope in just such a hedonistic setting on Crete's rocky northern coast. 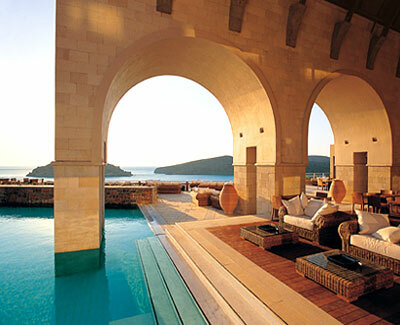 Rooms have inviting terraces or balconies, most with sea views, and more than half have their own infinity pool. Candlelit open-air dining overlooking Mirabello Bay is the perfect way to foster romance. 4. Ladera Resort, St. Lucia: Guests can cast off all their inhibitions at this open-air hideaway, where the room is literally thrown open to views of the sky and sea, making guests feel as if they are living in an elegant treehouse for grownups. All suites have canopy beds and plunge pools, some with soothing waterfalls. 5. Maroma Resort and Spa, Riviera Maya: Perhaps the reason guests feel that magnetic attraction is because Maroma's airy, white-stucco buildings — crafted by local Mayans — are oriented to ancient astrological principles of harmony. Each of Maroma's spacious suites is unique, with an elegant bathroom, Mexican caftans for lounging instead of robes, and a handmade silk hammock on a breezy terrace. Everything, from gourmet dining to yoga sessions at the spa, is meant to foster a sense of delight and well-being. 6. Sivory Punta Cana, Dominican Republic: This new luxury resort — in a quiet, untouristed area 45 minutes north of Punta Cana — has only 56 suites, some with plunge pools, and all with a stocked wine fridge to further set the stage for romance. Sivory's three restaurants serve Mediterranean, French, and Asian-Caribbean fusion cuisine. There are also miles of luscious, deserted beaches to stroll in the moonlight. 7. Bora Bora Lagoon Resort & Spa, French Polynesia: Overwater and beachfront bungalows look across the shallow turquoise lagoon to mystical Mount Otemanu rising in the distance — what could be more enchanting? How about the open-air treatment rooms of Maru Spa, or the "canoe breakfast" delivered by Polynesian staff in a flower-bedecked outrigger canoe — a Tahitian take on traditional room service. 8. Lilianfels Blue Mountains Resort & Spa, Australia: Take a step back in time with a three-hour train ride from Sydney to Katoomba, where Lilianfels sits on the edge of beautiful Jamison Valley and looks across to the Blue Mountains. This very elegant, European-style country hotel has 85 rooms and suites with windows that open to the fresh mountain air. Guests can reconnect with spa treatments, dining at Darley's restaurant, or just relaxing together in the gardens. 9. The Viceroy Bali, Indonesia: Serene and uncomplicated in true Asian style, The Viceroy Bali has the sensation of almost floating on its hillside at the edge of a steep river gorge. Cool and elegant villas are arranged in very private settings, each with its own swimming pool and an enclosed garden. Guests love the very sensual indoor-outdoor garden bathrooms in the Garden Villas, and the waterfall wall in the Viceroy Villa is quite romantic as well. 10. Little Palm Island, Little Torch Key, Florida: Reachable only by boat, this idyllic hideaway has only 28 suites set in stilted, thatched-roof bungalows under swaying palms. Delicious candlelight dinners are served right on the beach.